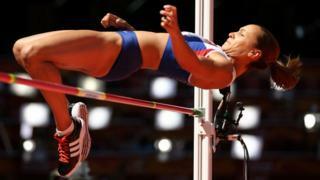 Great Britain's Jessica Ennis-Hill leads the heptathlon at the halfway stage at the World Athletics Championships in Beijing. A total of 4,005 points left Ennis-Hill 80 points clear with the long jump, javelin and 800m to come on Sunday. Her compatriot Katarina Johnson-Thompson moved up from ninth to second after an impressive 200m. Coverage of the second day of the heptathlon will be live on BBC Two and online on Sunday, culminating with the 800m at 12:40 BST.